A conversation: Brendan Macdonald reviews Ad Infinitum’s new show about fatherhood. No Kids at Pleasance Courtyard. Photo: Alex Brenner. 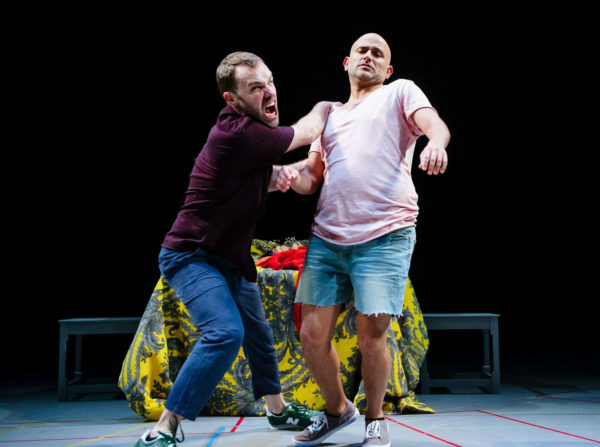 No Kids is the first time artistic directors of Ad Infinitum George Mann and Nir Paldi – who are a real-life couple – have co-starred in a production together. For them, the subject matter scripted such collaboration: the show is a live engagement with their decision of whether to have kids or not. The set is built of two clothes racks with colour-coded clothes to – a bit predictably – create a rainbow on the otherwise black set. These are used to brighten the space, but also act as costumes for Mann and Paldi when they switch between characters. Playing potential surrogates, adoption agency staff, and even their potential child, Mann and Paldi work cohesively as a unit, grappling with a personal question for both of them. With a Madonna playlist looping in the background, they produce a physically demanding but impressively executed spectacle, with moments of humour and vulnerability throughout. The play is built on potential scenarios. Mann and Paldi act through, with varying degrees of dramatic or melodramatic intensity, the hypotheticals swirling around, such as whether they adopt, have a child through surrogacy, or remain a family of two. Arguments for having children include living out personal dreams, and their belief that they would make good parents; arguments against include the environmental impact, the challenging processes of having children as a gay couple, and the potential difficulties that arise from being two dads. Some of the best moments are when Mann and Paldi scrutinise the current landscape of surrogacy and of adoption practices, both processes being complex, complicated, and sometimes ethically questionable. Frustratingly, however, and contrary to what the title might suggest, no conclusion is ever really made and so the dramatic stakes remain pretty low. Paldi and Mann do at times raise challenging questions, but they then shy away from them and instead veer off to another question. Both Mann and Paldi give us coming out stories, unquestionably important events in their lives that could impact their decision to raise children, but these touching moments are not suitably stitched into the underlying question and take time away from potentially deeper discussions of aforementioned topics. No Kids is a slick but by rote exploration of the decision to have children, but what ultimately resonates is that, even though Mann and Paldi do not reach a decision, they are having a conversation. It’s taxing, knotty, and emotionally immense. But it’s also a necessity for them, unlike many couples, in order to becomes parents. No Kids is on until 27 August 2018 at Pleasance Courtyard. Click here for more details.